Removing spots from carpet can be simple or tedious depending upon the spot and how long it has been on the carpet. At times, multiple applications of the spot removal solution, or a second solution is required. Listed below is a general spot removal procedure. If the origin of the spot is unknown, begin with Step 1. If the origin of the spot is known, begin at the appropriate step. Never use a circular motion to remove a spot as this destroys texture. To prevent wick up, the final step should always be to rinse with clear water, blot dry, and put a thickness of several white paper towels over the damp area. Put a brick, or suitable weight object on the pad of towels to keep the pad in contact with the carpet. This allows any stain wicking up from the backing to go into the towels rather than remain on the carpet surface. Allow to dry, remove the brick and towels, and brush up the pile. Be certain to try, on an inconspicuous area of your carpet, any solutions you plan to use as it may affect color or texture. Do not use if color in the test area marks off on a white paper towel. – White paper towels or white terry towels. – Spray bottle for applying detergents and special solutions. – Household ammonia solution, which is 1 tablespoon of clear household ammonia to 1/2 cup of water. – 3 percent hydrogen peroxide. – White vinegar solution made up of 1/3 cup of white vinegar and 2/3 cup of water. – Approved carpet spotters available at carpet stores and other outlets. – Spoon and dull knife. – Brick or brick paver. Step 1: Remove as much of the foreign material as possible by blotting with a white paper towel or scraping with a dull knife. Apply isopropyl rubbing alcohol to a clean white cloth, white paper towel, or cotton ball. If the spot extends deep into the pile, use a blotting motion until the spot is removed or no color is transferred to the cloth. Do not allow the alcohol to penetrate into the backing as this will destroy the latex bond. If the spot is on the surface only, rub in one direction at a time. Never use a circular motion to remove spot as this may destroy the texture. Stop if spot is removed. If not, go to Step 3. Step 2: Blot up as much of the spill as is possible. A wet vacuum is useful if a large quantity of liquid was spilled. If spot has dried, saturate the tufts in the affected area with tap water (do not overwet). Allow to remain for about 1 minute and blot. If the spot is being removed using water, continue until the spot is completely removed. Blot dry and apply the paper towels and brick. If it is not completely removed, go to Step 3. Step3: Remove as much of the foreign material as possible by blotting with a white paper towel or scraping with a dull knife. Apply a small quantity of detergent solution to the spot. Use a blotting motion to work the detergent into the affected area. If spot is being removed, continue applying detergent and blotting with a white paper towel until spot is removed. If there is still some stain on the carpet and blotting is not removing it, then moisten the tufts in the stain area with 3 percent hydrogen peroxide. Let stand for one (1) hour. Blot and repeat until carpet is stain free. Light will cause peroxide to change back to water, so no rinsing is necessary. A. Blood, catsup, cheese, chocolate, cough syrup, mixed drinks, soft drinks, soy sauce, starch, toothpaste, water color, and glue. Blot with white paper towel to remove as much of the stain as possible, then neutralize with an ammonia solution. Saturate spot using spray bottle. Do not wet backing. Blot with a white paper towel to remove excess moisture. After neutralizing, begin with Step 3 of General Procedures. All solutions for removing blood must be cool. Blot with a white paper towel to remove as much of the stain as possible, then neutralize with the white vinegar solution. Saturate spot, using a spray bottle, and blot to remove excess moisture. After neutralizing, go to Step 3 of General Procedures. Remove as much of the stain as possible by using a spoon or dull knife. 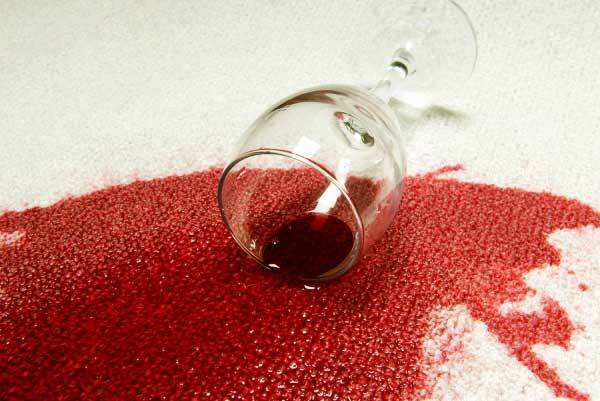 Blot up as much of the stain as possible, then neutralize by spraying the affected area with the ammonia solution. Care should be taken to remove all protein matter. Blot to remove excess moisture and go to Step 3 of General Procedures. Spread brown paper (such as a grocery bag) or a terry cloth towel over the area and iron with the setting on “warm.” The wax will be absorbed into the paper or towel. Remove any traces with alcohol or dry cleaning fluid. Freeze the gum using an ice cube. Shatter the frozen gum with a knife handle and vacuum. Some citrus based products such as De-Solv-It® by Orange-Sol have been demonstrated to break down the stickiness of gum so that it can be removed. Allow mud to dry completely. Shatter the dried mud with the handle of a knife and vacuum. Go to Step 3 of General Procedures. Saturate spot with lemon juice, using a spray bottle, and allow to remain for five minutes. Go to Step 3 of General Procedures to remove lemon juice. If this does not work, and it may not, call a professional. Most rust removers contain a very strong acid and are, therefore, not recommended for use by homeowners. Remove as much of the nail polish as possible using a spoon or dull knife. Apply a non-oily nail polish remover to a clean white cloth and gently rub (in only one direction at a time) or blot the spot. Continue until spot is removed. Do not allow nail polish remover to get to the latex backing. Go to Step 3 to remove nail polish remover. Vacuum using the crevice tool of vacuum cleaner to remove the soot. If all, or most, of the soot has not been removed, call a professional cleaner. If vacuuming has removed all particles, go to Step 1 of General Procedures to remove any traces. Acid toilet bowl cleaners, acne medication, alkaline drain cleaners, chlorinated bleaches, hair dyes, iodine, insecticides, mustard with tumeric, plant fertilizers, and stains of this nature cannot be removed as they have permanently altered the carpet’s color. Call a professional. Most likely the only solution is to cut out the stained area and insert carpet from a closet, or some other area, into the area where the spot was cut out.